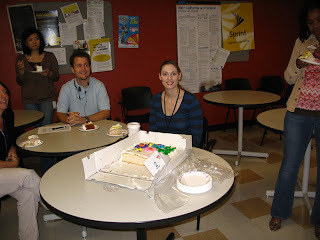 Sunnin' In the City: My Birthday at work! This is the conference room that I have been camping in with Michael. This is Michael...hard at work. Ok, so maybe turning 31 wasn't SO bad. 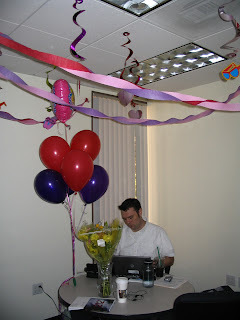 I came to work, and some of my employees had decorated the conference room for me. They also bought me flowers (2 sets, although only one is showing) and a big bag of relaxation items. In fact, now that I think about most people got me gifts that are geared at relaxing...do I look too stressed? This is one of the sets of flowers - very pretty. 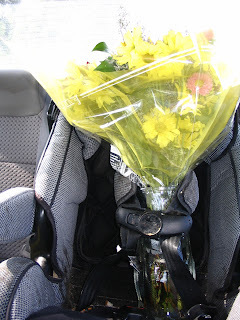 I put them in the car seat (Caiden was with Dave) to protect them on the way home. My mom came and brought me cake in the morning, and so we all filled up on sugar at like 10:30am, and then the team bought me cupcakes and sang a very spirited rendition of Happy Birthday which actually embarrassed me and made me blush. I know. I am really not one for a lot of attention. I kind of like to blend in.